» Souper Bowl I: At Least You Won Something, New England! New Englanders may feel as if they’re crunching on shells today, but they’ll always have Manhattan. Clam Chowder, that is. As the morning — and its attendant beery hangover — breaks on the day after the Super Bowl, it might be nice for those gloomy souls in Beantown to reflect on the one area in which they still hold an insurmountable edge over New York: soup. Of course, it wasn’t Manhattan Clam Chowder that New England vanquished Sunday in the evening’s second-most-interesting championship. (That inferior potage lost in the first round after barely winning its play-in game over Mushroom Barley; there were allegations of tomato juicing.) But can you forgive me for reaching for a broader context? What began a week ago as a celebration of liquid delights quickly collapsed into a cultural and aesthetic street fight with tensions running thicker than any roux. There were accusations of racism and edible ignorance, whispered talk of backroom deals being consomméd and consummated. Fits were pitched and tureens were tipped over injustices in the bracketology (Potato Cheddar a 4-seed?) and the seemingly arbitrary decision making behind the entire event (to our friends in New Orleans, the disqualification of gumbo was a slight on par with Taylor Kitsch’s Cajun accent in Wolverine; personally, I blame Treme.) After such a roiling emotional boil, is it any wonder that the grand finale seemed inevitably over-reduced? Still, a winner must be crowned and Clam Chowder, that hardy Pilgrim staple, won the day — and won it handily. (Clams may be divisive, but it’s never wise to bet against bacon.) But, oh, did I neglect to mention the bisque? It’d be an oversight to yada yada the other finalist, but really, does anyone think Lobster Bisque deserved to be here? It’s a streaky, often disappointing bowl lifted well beyond its station by the imposing presence (and reputation) of its star recruit. Even worse, it, like the eventual winner, is a cream-based shellfish soup. This wasn’t a championship match, it was an intramural scrimmage or, better yet, a company softball game at Legal Seafoods. 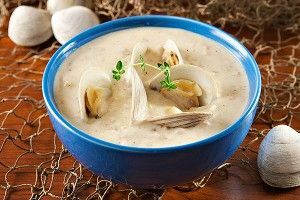 New England Clam Chowder vs. Lobster Bisque was like the Subway Series. (In this case, the “T Tussle.”) A regional skirmish of no real interest to the wider public. Think about it: In addition to those already sulking on the sidelines because Ramen was uslurped by a crafty crustacean and cheesy old French Onion managed to deliver a heaty F.U. to Pho, this creamy treif battle disenfranchised huge swaths of the soup-loving populace, including the kosher, the lactose intolerent, the squeamish, and those in warm-weather climates. A generation of cranky Jewish grandparents in Palm Beach were left kvetching into their goulash. But this is your day, New England. (Except where it isn’t.) As a vanquished Lobster Bisque hangs its carapace in shame, drowning its sorrows in Pernod shots at the Yacht Club, the humble Clam Chowder pahks its cah in the winner’s circle. Bravo, Chowder. You may not spark the imagination but you warm the belly. In a tournament such as ours, sometimes that’s enough. The inaugural Souper Bowl taught us much about ourselves and our appetites. Feelings were hurt. Tongues were scalded. Dental bridges were burned. But in the end, we were united by our national love of a good bowl and our deep-seated hatred of salad. Until next year, America. Keep your friends close. But keep your ladles closer.